I received a bag of these chips in my July Knoshbox! When I eat salty snacks like potato chips, I really want iced tea. I want something that’s easy to guzzle down to quench the thirst fast. This Strawberry Mint Julep White Tea from 52Teas makes a really refreshing iced tea, and the sweet berry notes and crisp minty notes offered an enjoyable contrast to the tangy vinegar and salty chips. Salt & Vinegar chips are one of my favorite flavors, I love the contrast between the salty, the tangy and the hint of sweet that I get from these chips. So, I didn’t mind a bit when these chips were featured in my July Knoshbox. These are “Kettle” style chips, which means that they are thicker than your average potato chip. They are crunchy … but what I’m liking is that even though they’re very crunchy … there is something different about this crunch. You know how sometimes you get some of those other kettle-style chips out there, and there’s more crunch than substance? The chip seems to be so crunchy that it’s difficult to bite into it. These are crunchy … but they’re not “hard as a rock” crunchy. They’re crunchy with that light “crispness” that a thinner potato chip has. I can taste the potato here. 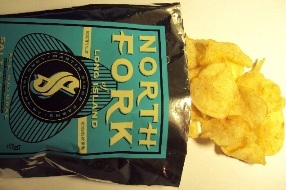 On North Fork’s “Our Story” page on their website, it says that the reason why the potato flavor shines through is because these are fried in 100% Sunflower Oil. As someone who has not fried a whole lot of potato chips, I’m going to believe what they say based on two things: 1) I don’t fry a lot of potato chips so I really don’t know if there is a difference in oils or not, and 2) as I’m munching and crunching my way through this bag of chips, I can TASTE that there is definitely something different about these chips. I also like that the salt and vinegar has not been overdone here. They’re salty … sure. They’re tangy and vinegar-y … yep. But the flavor is not so overpowering that I’m not tasting the potato goodness that these chips have. In some of the salt and vinegar chips that I’ve tasted, there is so much flavoring that is all I taste. I like that I’m tasting the potato. These are really good. I’d love to try some of their other flavors. 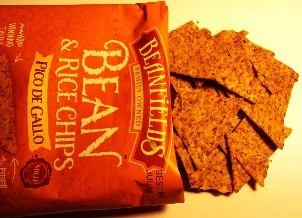 I find myself intrigued by their Sweet Potato flavor as well as their rosemary and garlic flavor. I’d definitely consider ordering more of these! They are definitely YUMMY! Crunchy wagon wheel pasta flavored with cheddar cheese and a hint of jalapeño heat. These unique pasta chips combine the look and taste of pasta with the delightful crunch of a chip. With 50% less fat than regular potato chips, it’s okay to indulge. 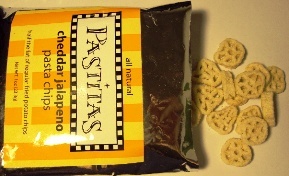 I received a bag of these pasta chips in my June Goodies Box! With these zesty chips, I wanted something that I could guzzle when I needed to help quench the jalapeño heat that builds on the palate, so I turned to iced tea. The iced tea that I had chilling in the fridge when I opened this pouch of chips was this Lime Cola Flavored Black Tea from 52Teas. YUM! I really like the way the tangy flavor of the lime contrasts with the warm spice of the jalapeño. I didn’t know what to expect when I opened this package … pasta chips? Weird! And they are indeed weird! These are the most unusual “chips” I’ve encountered in some time. The size and shape is reminiscent of “Honeycombs” cereal. The texture is crunchy, I was almost expecting them to have the texture of uncooked pasta, although I’m not entirely sure why. 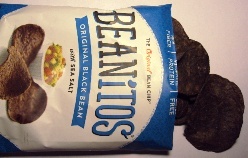 They have a texture that resembles a dense corn chip, but without the grain-y mouthfeel. Very different, but not at all unpleasant. On the contrary, I’m actually enjoying these quite a bit. The chip itself is very “different.” It doesn’t taste potato-y or corn-y or like any other type of chip that I’ve ever tasted. I like that these don’t taste or feel greasy like a potato chip usually does, I like that these have a good, crisp texture, and a really hearty taste that is quite satisfying. There is a good balance of cheddar and Jalapeño pepper flavor. These aren’t super hot as I thought they might be given the fact that they’re called “Cheddar Jalapeño” … this is more like a nacho cheese sauce kind of heat … you know the kind of cheese sauce that has some diced jalapeño peppers already in it? It’s a lively amount of heat, but not so much that I have to extinguish a fire on my tongue after each chip. The warmth builds gradually in a very agreeable way. I would definitely buy these pasta chips again. I really liked them. I visited the Pastitas website and found that they have six different flavors and I’m definitely intrigued! I’d love to try them all! Almost caught up … I can feel myself reaching the finish line… well … I’m almost caught up with the box reviews … as for the individual reviews … that almost seems like a losing battle. ha! There are two samples of Sir Kensington’s Ketchup: Original Gourmet Scooping Ketchup and the Spiced Gourmet Scooping Ketchup. Don’t get me wrong, I’m thrilled to be getting more of this ketchup because I love the stuff … but, I’m already a customer of Sir Kensington’s and have been ordering directly from them for a while now. Then there are the Elephant Ear Marshmallows from 240Sweet. Again … happy to be able to consume these again, but, I’ve already tried this flavor! I would have loved to get a flavor I haven’t tried from them yet. Oh well, the box isn’t a total loss … because there are some worthy products that I look forward to trying, including the Toasted Sesame Seed crackers from Castleton Crackers. These are graham crackers! Having tried Castleton Crackers previously, I’m thrilled to be able to try another variety from this company. 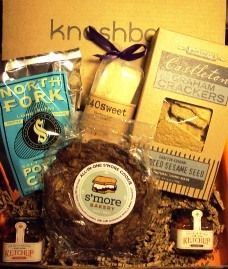 Also in this box there is a bag of Salt & Vinegar Potato Chips from North Fork and a huge S’more cookie from S’more Bakery. Unfortunately, my cookie got smashed in transit. Hopefully it will still taste yummy! I’ll be sure to post reviews of the three items I’ve not yet tried from this box soon! Posted: August 28, 2013 in Goodies Co.
July’s Goodies Box brought something a little new … the box itself! The box is a little smaller, but, with a smarter design with two compartments which makes it an ideal shipper for the drink that is often included in these boxes. Usually, the drink is together in the large box area, and it moves around and possibly crushes the food … or, they need to wrap the drink package with bubble wrap to help prevent the crushing of the food. This new box design keeps the food separate from the drink … and this way, the delicate chips and cookies don’t get crushed! June brought some very intriguing offerings from Goodies Co. The first item that I tore into was the Cherry Lovers Candies by Gimbal’s Fine Candies. Overall, these were a really great addition to the goodies box. Some of the candies were super yummy, while others I found a bit too much on the “too much” side. Let me explain: I love Jelly Bellys, however, my least favorite flavors are the cherry flavored ones, because they are just too … tart yet cloyingly sweet – if that makes sense. That’s what I mean by “too much”. 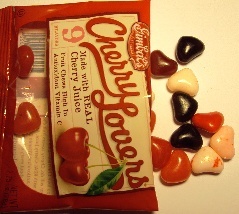 The Cherry Lovers have nine different flavors: Cherry Daiquiri (too much), Chocolate Cherry (YUM! ), Kiwi Cherry (I only had one of these in my bag, and it wasn’t enough to form an adequate assessment. ), Bing Cherry (too much), Wild Cherry (too much), Black Cherry (too much), Cherry Vanilla (Very YUM! ), Cherry Cheesecake (my favorite! ), and Cherry Cola (another very, very YUM!). So, as I said, overall, a yummy package of candies … but, some of them were just a bit too much for my liking. Also in June’s box were Fresh Corn and Sea Salt chips from The Better Chip, Caramel Corn from Cosmos, Original Multi-Seed Crackers from Crunchmaster, and black raspberry flavored fruitwater from Glacéau. Individual reviews for each of these will be posted later! Overall, I was a little disappointed by this box, as it seems like there were fewer “goodies” than in past boxes. However, I did enjoy the Cherry Lovers candies and look forward to trying the other items as well. Still a great value at $7! The Goodies Box for June! Posted: August 25, 2013 in Goodies Co.
Yeah, I’m way behind. I’ve said it before, and here I am saying it again! Fortunately, though, the Goodies Box is getting better with arriving in a timely manner. June’s box arrived on the 27th of June and while it isn’t the biggest deal when the box arrives a day or two (and in some cases three or four!) days after the month is over, I like it when they get their act together and the box comes within the month it should arrive. 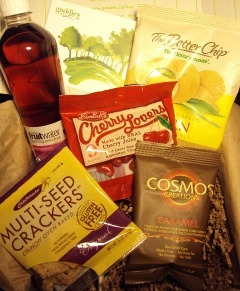 This month’s box seems to be all about snacking. 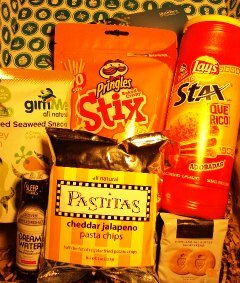 There were six products in this month’s box, including a full-sized tube of STAX Que Rico Adobadas Chips, which I’ve already tried. These are pretty tasty. They remind me a lot of Pringles, not just because of the nature of the packaging, but the chips themselves have the same texture and potato taste as Pringles snack chips. That said, the flavoring of these chips is pretty unique, tasting like a cross between a spicy BBQ and a picante salsa flavor. These definitely have some kick to them! The Cheese flavored Pringles Sticks were also tasty. These remind me a lot of “Cheese It” type crackers, except that they’re long, very slender sticks rather than square crackers. They’re crunchy, cheesy, and a lot of fun to eat. The other three products in June’s box include: a sampler package of Duchy Originals Highland Shortbread cookies, Cheddar Jalapeno Pasta Chips from Pastitas, a bottle of “Dream Water,” and Honey Dijon Roasted Seaweed Snacks from Gimme. That last one is one that makes me a little nervous, because I am not a fan of seaweed. I’ll try ’em, but I have a feeling I won’t be finishing ’em. I guess we’ll see! I can’t say that I’m overly enthused by the contents of this month’s box, although I am interested in trying the Pastitas chips because of their uniqueness factor, and the Dream Water holds some appeal as well. This card also includes a promo code for those who want to subscribe without a waiting list. (So if you want to subscribe without the waiting list – I wasn’t aware that there was a waiting list! – just be the first to comment on this review, include your email address, and I’ll email you with the promo code. But I preferred getting the product card that told me a little bit about each product. This new card gives the box a much more “generic” sort of feel. It’s still the best “bargain” tasting box that I’ve found … even if the products aren’t as gourmet as what I’d find with some of the other subscriptions I’ve tried. Wake up your taste buds! These zesty chips are great all by themselves or served with your favorite salsa or guacamole. Because these chips have a little bit of a spicy kick, I’d recommend an iced tea so that you can gulp it down to help cool the palate! This Cranberry Mango Green Tea from Zen Tea tastes GREAT iced, and I like the way it tastes with these Pico De Gallo chips! It’s sweet, fruity and refreshing, while the chips have a nice, zesty crunch! A nice pairing! These are really different – but also really tasty! They taste kind of like tortilla chips that have been dipped in bean dip and then taken for a quick dip into a bowl of zesty pico de gallo salsa! They’re spicy but not super-spicy – they have a nice heat to them without overwhelming the palate with a lot of spice. I’m really enjoying the texture of these too. They’re crunchy, but they aren’t “hard-crunchy” like a traditional tortilla chip (or corn chip). Instead, it’s a light yet hearty crunch. The rice keeps the texture lighter – its more delicate than the heavier texture of a corn chip. I’d definitely pick up a bag of these if I saw them in the supermarket. And according to the supermarket locator, these can be purchased at my local Whole Foods! I’ll look for them the next time I’m there!